When I was a kid, my best friend and I loved sleepovers. I remember one that ended badly, though. In those days, my bedroom was above the kitchen, up a narrow, iron spiral staircase. 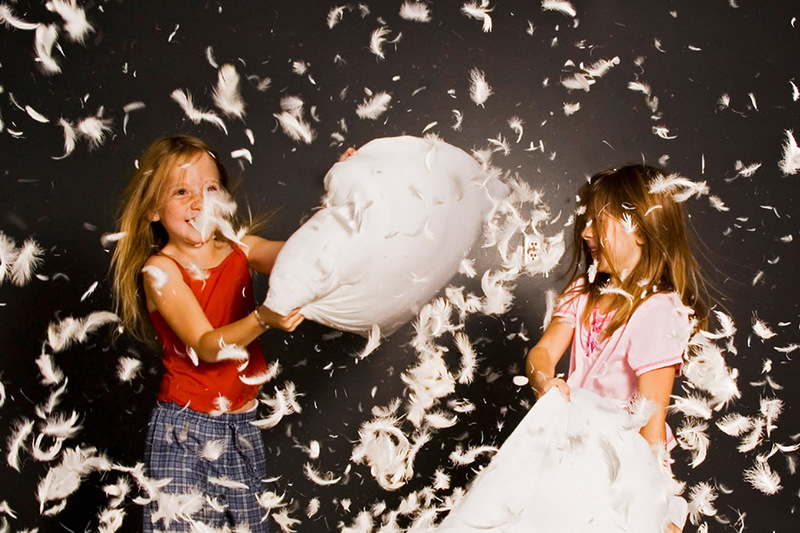 We were in my bedroom having fun – until the pillow fight. Well actually, the pillow fight itself was fun! Even when one of the feather pillows burst and snowed feathers everywhere in my room, down the spiral staircase, and into the kitchen. We thought that was really fun. But – my mom sure didn’t! And her reaction wasn’t fun at all. I have a little secret. I’m a nice mom, a fun mom, a fairly laid-back mom. I love being a mom. But, I hate sleepovers. As I was writing this post, I watched my youngest sleep so soundly he didn’t hear the dog barking at a visitor, snored through my conversation with the neighbor, and didn’t seem to smell the homemade mac-n-cheese as it baked (that is the most shocking). He was just that tired. And for what? A night of bonding with the buds over endless video games or movies while eating junk food? Yup! Most kids seem to love the idea of sleepovers. But the reality is they can be hard on everyone. Sleepovers do happen. You can make them fun, safe, and manageable with these tips. Allow your child to stay only with families you know well and trust. Once my son went to a birthday sleepover with a family I didn’t know. The next morning, I found him lying alone in a room feverish and vomiting while the other kids played basketball in the driveway. No one noticed he was ill all night. Talk about issues of personal safety and physical boundaries ahead of time. Specifically, review the rule that no one should ask to look at, touch, or photograph your child’s private parts. Talk with the hosting parents before you drop your child off. You might ask: Is there a gun in the house? Who else will be there? Are there older kids at home? What media will the kids be allowed to use? Who will stay up to monitor the kids? Review with your child how to get to the parents in the middle of the night. Where is their bedroom? Which parent can be woken up if your child needs an adult? If your child doesn’t have a cell phone, show them where there’s a phone in the house. Let them know that they should call you at any time for a pickup. When you’re hosting, accept you won’t be asleep before the kids. Leaving a bunch of mischievous kids awake while you nod off just seems foolish! Don’t allow cellphones past a certain hour. This prevents group-inspired and sleep-deprived texts and pictures! Let the kids know this ahead of time so they will be ready to hand over the phones. Set a time limit – the kids go home if not asleep by midnight (or whatever time you set). And mean it. Feed them well – but not too well. Hungry kids are not happy kids. And half the fun of a sleepover is eating fun food! But filling kids up with too much junk is a recipe for upset tummies. Try some healthier options: order pizza on a whole-wheat crust, make popcorn lighter on the butter. Or bake pumpkin muffins – a favorite in my house! You’ll be amazed by how quickly carrot sticks and apple slices disappear. Stop the food service an hour or 2 before bed. Let the kids and their parents know when the party’s over. Maybe get them up and out by 10 a.m.
Of course, you can also not have sleepovers at all – which may be the best choice for you and your child. I’ve given in to allowing my kids to have sleepovers. So far, they’ve had lots of fun, watched and played too much media, and stayed up late – but they haven’t burst any feather pillows. And truth be told? I’ve kind of enjoyed watching the fun!